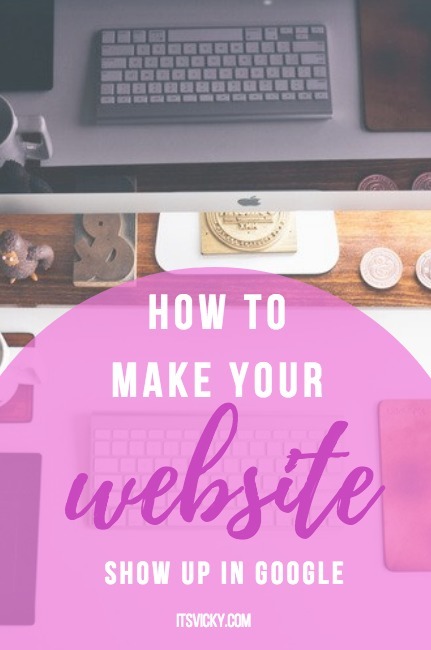 You have your website up and running but the big question is, how to make your website show up in Google, Bing, Yahoo and other search engines? They all operate pretty similar but let’s focus on Google for this post. Google develop and evolve their search function constantly. In the past, they showed paid ads and organic listings in their search, today there are a lot more to it. The results showing in Google today depends on what you are looking for. Before we dive into how to get your content and your website to show in Google let’s look at some common searches to get the basics of where you can be seen with your site. What are you offering on your website? What are people searching for that would be relevant to your site? Let’s look at a few examples. As you can see the first thing that shows up are relevant products. These are Google’s own ads and they might be compensated if you click the product ad and purchase something. The next section is the ad section. This is where you can show up if you purchase an ad via Google Adwords. You would set up an account with Google Adwords, adjust the settings and create your ads. You will get charged per click to your website. Featured snippets are what you might see next. 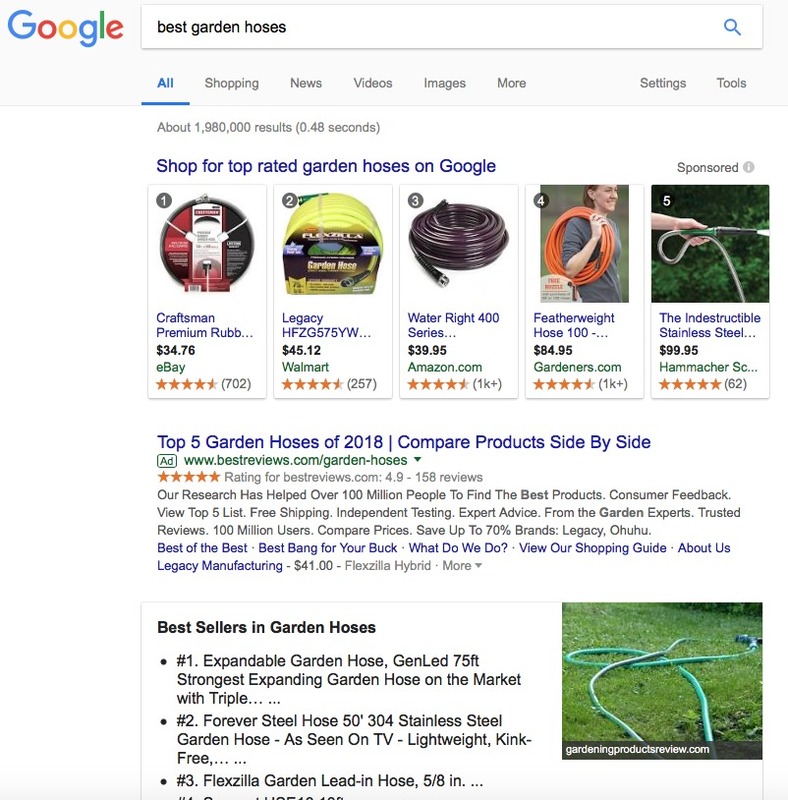 In this case, an article “Best Sellers in Garden Hoses” from gardeningproductsreview.com has got the featured snippet section. Next is usually the “People Also Ask” section and not until after that comes the organic listings. There’s a lot of scrolling to just get to the organic listings. Another place where you can show up in Google with your website is under the other sections, shopping, news, videos, images and more. Take images for example. If you use a keyword to name your image, your picture from your website might show up in the image section in Google where visitors can find the image, click on it and get to your site. Another common search is the local business search including restaurants, shops, and other services. 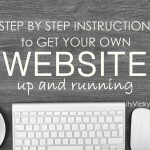 Do you have a local business website that you are trying to rank? Let’s take a look at the options you have. 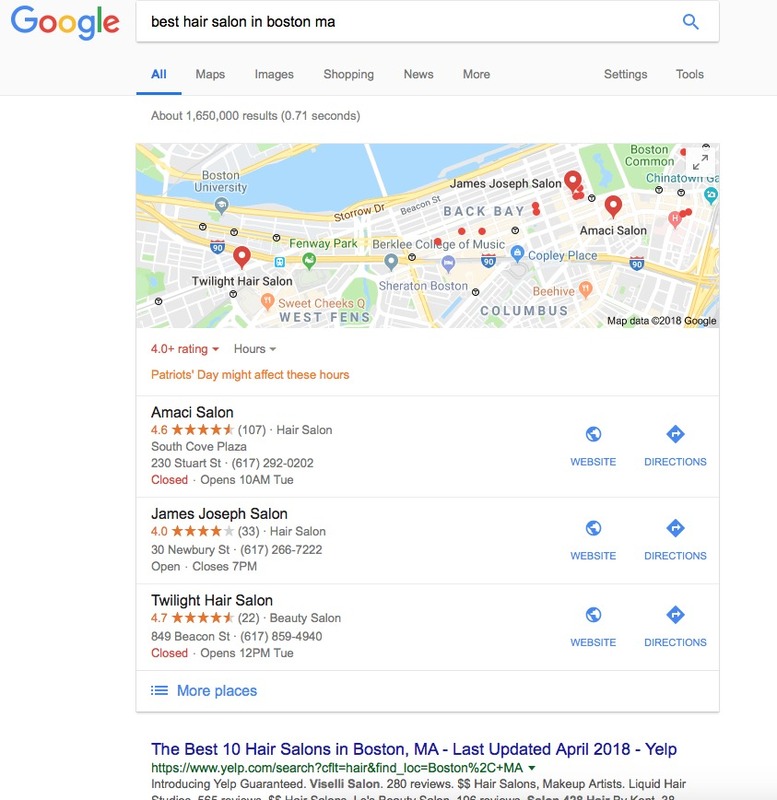 Let’s see what shows up in Google if we type in “best hair salon in Boston ma”. The first thing that shows is a map with local listings. 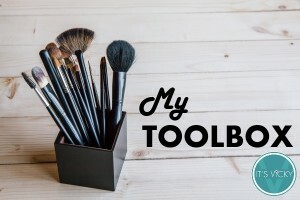 You can be seen here by signing up with “Google My Business” a free tool provided by Google. In some cases, you will see paid listings after the local business listings but in this case, organic listings show right away. Again you can also try to rank in maps, images, shopping, news and more. Informational content can vary greatly but let’s take a look at the search “how to bake bread”. 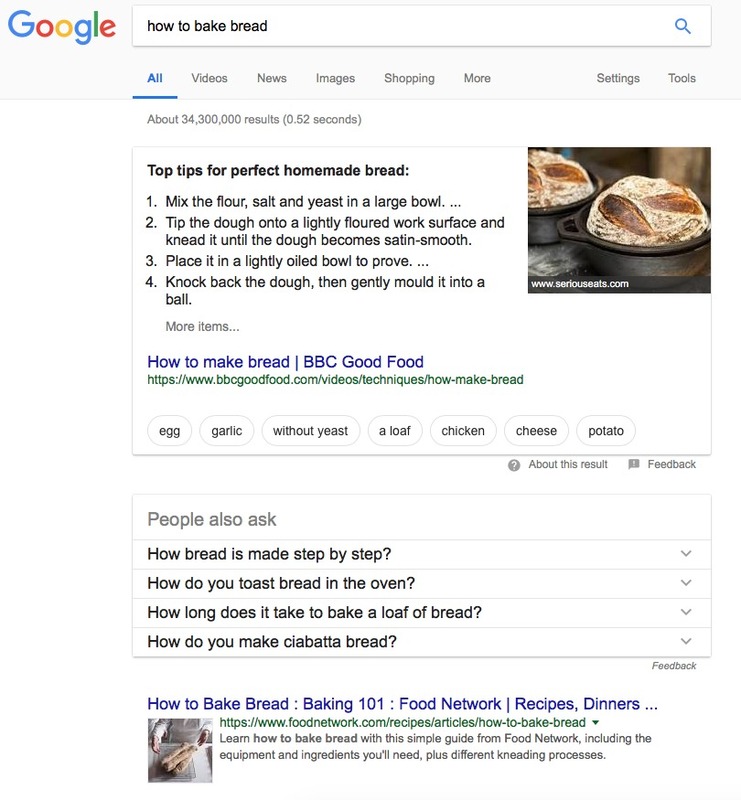 The first thing that shows up is a featured snippet on top tips for perfect homemade bread, then we have the “people also ask” section followed by videos on how to bake bread. For this search, we see no paid listings or local listings. Now when we have talked about three different search types, we can see how Google delivers the results in different ways. Let’s talk about how your website can show up and be seen on Google. 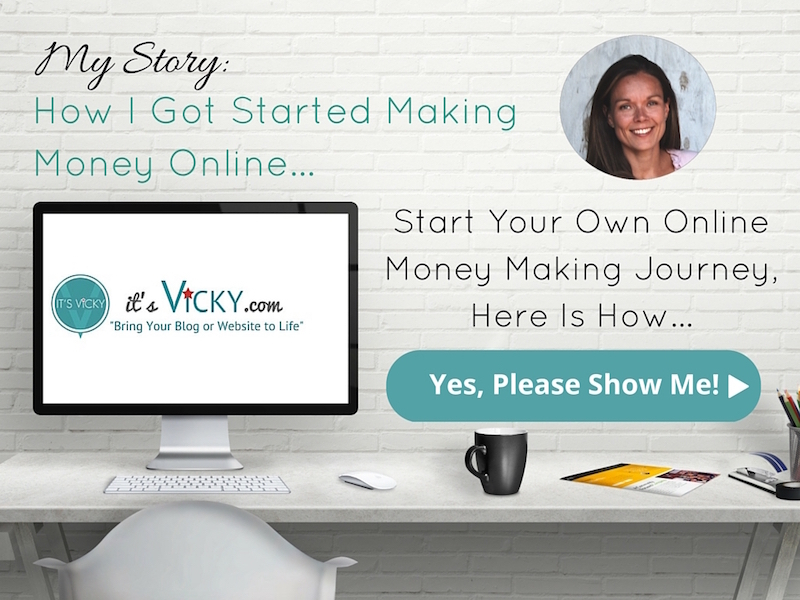 Like we talked about you have different places where your website can show up, both paid options and free options. For your paid option you can join Google Adwords and have your ads show on Google and on other websites. If you have a local business you can join “Google my business” and get a free local listing on Google. A lot of website owners are looking to rank in the organic listings for free, doing this well can also result in a “featured snippet” listing or inclusion in the “people also ask” section. Let’s take a look at a few things you can do to increase the chances of good rankings in Google. 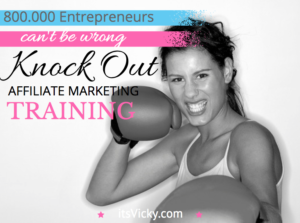 Is Your Website Brand New? If you have a brand new website, you will have to let Google know that your site is live and out there. There are a few things you can do to help Google out. On your website install an SEO search engine optimization plugin, I prefer the All in One SEO pack. This plugin will help your site get ready for Google inclusion. Sign up and add your site to “Google Search Console” this is one of Google’s own tools to help you get more data about your site. You can also submit content and make Google aware of new content and updates. It’s also a good tool to communicate with Google if needed. Activate XML sitemaps, this will help to rank your content pieces and make it easier for the Google “spiders” to crawl your content. Submit the XML sitemap to Google search console. These are 4 things to do with a new site, to get your site set up for ranking success in Google. 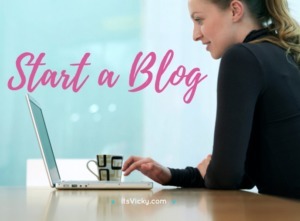 If you need detailed information about these steps, read my post – Basic SEO for WordPress – 5 Tips to Set Up Your Site Right. Now when we have the basics down let’s look at the individual content pieces, what we can do to have them show up in Google. To be able to rank your content in the free organic listings of Google there are a few things to think about. A lot of webmasters might be competing for the same ranking positions and you want to be the one ranking in the top 3. Before we get into the details let me just show you a graph. This is the keyword rankings from one of my sites that I do a case study on. This is a site that I’ve been working with for a couple of years now and you can see the ranking growth. If done correctly, over time you can see Google rankings grow and turn into free organic traffic. But how do you get that done? It comes down to providing great content that provides value to the reader, but that’s not always enough. Here are a few things you can do to SEO search engine optimize your content. Here are a few things to think of when creating and submitting your content to your website. The words that we type into the search bar in Google are called keywords. 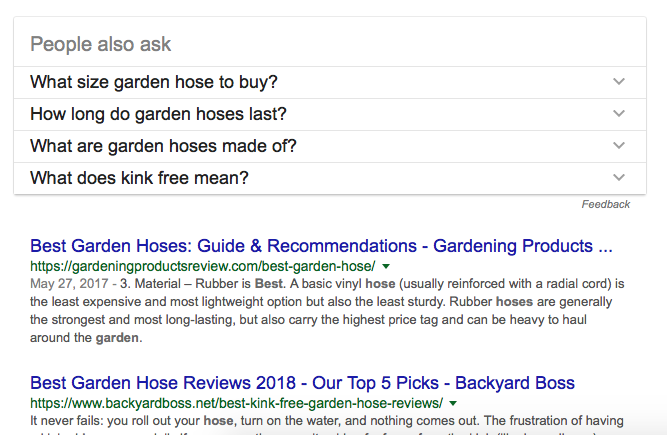 Typing in “best garden hose” into Google is a good example of using a keyword. We want to rank our content for the words that people type into the Google search bar. When somebody types in relevant words to your content you want your website to show up. This means that you need to know what people are searching for that’s relevant to your website. How many people search for the same thing and how much competition you have for that specific keyword. There are many different tools to use when it comes to keyword research, I prefer the Jaaxy tool. 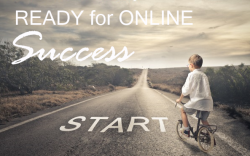 It’s easy to use, provide me with great keywords and give me quick results on chances to rank them. It’s important to find the right keywords and to use them correctly in your content, you can read more about keyword research and how that’s done here. Content can be delivered in many different ways, in the written word, in form of a video, audio, image and more. To rank in the organic section of Google the written word is important, and the length of the content matters. 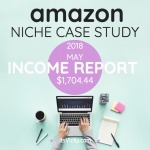 Going back to the case study I mentioned looking at the top 5 articles that rank well and generate most traffic 3 of articles where 1600+ words, 1 where 1100+ words and one 500+ words. Read more about content length in the post – How Long Should a Blog Post Be? When you have found a good keyword to base your content on it’s important that you stay relevant to that. If you are writing about garden hoses stick with that be relevant don’t dive into growing tomatoes make a separate post about that. Your reader is there to read about garden hoses, not tomatoes. Also, include relevant images, videos, graphs and other fun things to break up the text and make it easier on the eyes. Include your keyword to name some of those files. Now you have a great piece of content that’s keyword optimized and the perfect length. For it to get clicked when ranking you have to have a headline that sticks out, that people find interesting and want to click. I usually include the keyword but I also try to be creative. Ask a question, use numbers or how to for example. Make them want to click your listing. External links mean that you link out to another website. Internal linking means that you link to your own content on your site. As long as the links are pointing to other relevant content it’s great to link and connect with other content pieces. 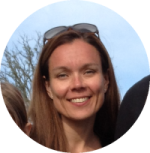 You want to engage the reader, make the content easy and interesting to read. Deliver value and involve the reader. Ask them a question that they can answer in the comment section, add a video they can watch, add a poll, be a little opinionated to see if they agree or disagree… Get your reader to engage with your content. You also want to make your content easy to share on social media and other places. If somebody like your post, encourage them to share it. If they do, that’s great that could mean more eyes on your content and website for you. 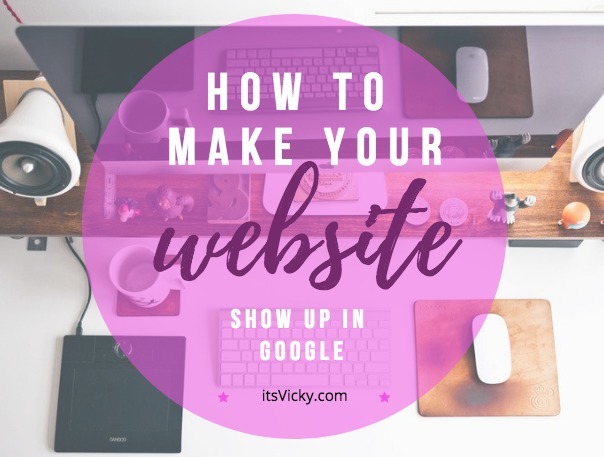 I hope this post shine some light on how to make your website show up in Google. If you have any questions at all I will be happy to answer them in the comment section below. Please also share your favorite tips on getting ranked in Google, would love to hear from you!